We take great pride in our homes. But sometimes, it can get a little stuffy staying indoors every time we have days off. There are so many benefits to having a deck. They give us a great, customizable place to lounge around outdoors removing us from the confines of our houses, increase the value of our properties – and they’re perfect for when you have (a little too many) guests over. Not to mention they bring a human touch to otherwise empty backyards completely overrun by nature. Whether you’re looking to implement a deck into your desolate outdoor space or redecorate the deck you already have, we’ve put together a list of 21 of our favorite deck design ideas (for both scenarios) to get you inspired! Decks on their own can add leisure to our lives, but this deck surrounding a sleek, rectangular pool really sets the bar high. The deck fits seamlessly next to the modern home and appears to have two levels. The top-level consists of a minimalistic-styled seating area and is equal to the height of the pool for easy, right-out-of-the-house access. The stairs to the left lead down to a presumably more expanded and decorated area that could be used for a variety of things: a tanning deck, dining area, or larger sitting space; while the remaining set of stairs leads to the grassy ground-level. This design is incredibly sleek, uniform, and clean-cut, without overdoing any design elements or creating a space that is too busy. This design would be great for any homeowner that prefers an open, uncluttered appearance or would rather put the focus on pool landscaping or other landscaping elements. 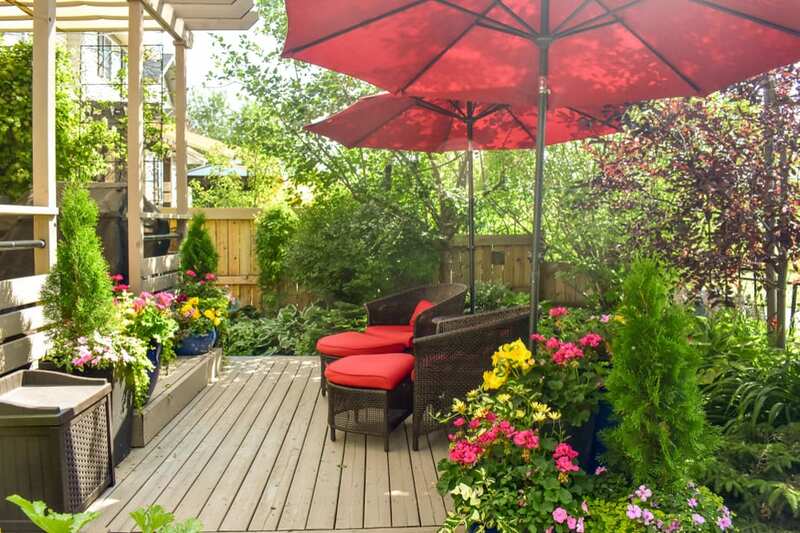 This is a very quaint deck, perfect for those who don’t have many guests over often or just want a small space outdoors to relax in the mornings and evenings. What’s so great about this deck is the lack of lighting from above or from the side of the home. The lighting for this deck is dim and comforting, coming from implanted places in the wood – primarily in the sides of the stairs, which light your path, and the corners of the deck itself. If you don’t have the means to implant lights into your deck’s staircase, lining the bases of the stairs with weather-proof rope lights would be a wonderful alternative with the same effect. 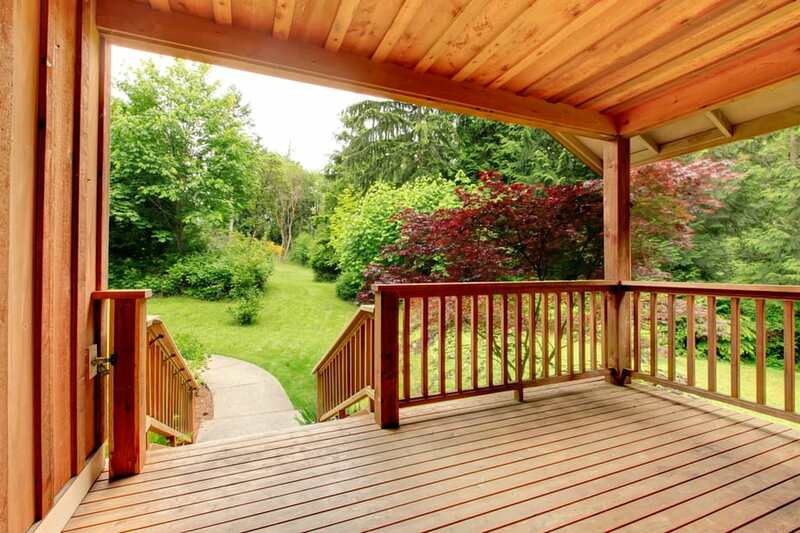 Another great aspect of this deck is that there’s just enough railing to separate the open yard from the seating area (as a privacy measure), along with the large, red umbrella for shade and privacy on sunny days. This modern deck extends from the home into a private, plant-surrounded paradise. The simplicity of this deck with its dark, natural wood color and cool-colored seating creates a calming environment for the utmost outdoor relaxation experience possible. It’s completely secluded from the influence of outside annoyances or disturbances and is complete with a soothing contemporary gas fire feature in the center of the deck. Decks with monotone colors, like the dark wood deck with the gray tones above, make wonderful backdrops for sporadic, brightly-colored focal points ( similar to the vivid green plants) . Uniformity and single-toned home decor is a modern theme that has become increasingly popular over the last few years, primarily because of its calm and uncluttered aura. What’s great about this gray-toned deck is the noticeable variation in texture with the painted brick wall and icy gray stripes on the windows. Though there is uniformity with the color scheme, the texture varies quite a bit from each wall, furniture piece, window, plant, and flooring, which really makes this space spectacular without overdoing patterns or decoration. Wicker furniture dates back for centuries but is most well-known to be a Victorian Era style. Though the appearance of this deck is more contemporary tropical than it is Victorian, the beautiful wicker furniture still exudes an old-time, homey feel that has been beloved by many. Wicker furniture is very eye-catching with all of the small, entwined wood pieces (or more commonly in this day and age, synthetic pieces) and they are most often neutrally-colored, making them great for bright or patterned cushions. This deck is one you’d likely see on the side of a large farmhouse. The colors here – dark cedar wood, and white vinyl fencing to match the house – are so great and work together in perfect harmony. It seems to be more modest in size, as well, which is wonderful for when you simply want a quaint getaway for having brunch with a few of your family members or friends. The vinyl fence lining the outer side of the deck is a staple American yard style (aside from the white picket fence) and provides some privacy. The simple outdoor furniture fits in perfectly with the neutral colors and umbrella shade, and the rocks on the side table create a natural decoration piece that looks great in this setting. Stationed in the center of a lush, secluded, colorful garden is this dainty deck. 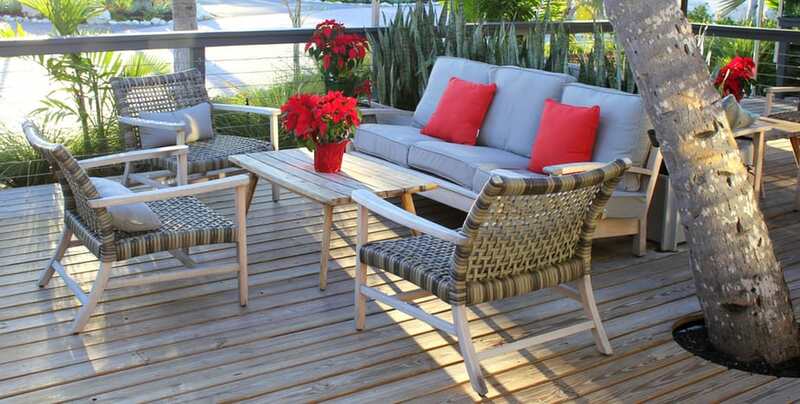 This deck is definitely for the plant-lovers who enjoy sitting in a relaxing area full of lovely natural creation. It extends from a covered porch on the side of the home and is complete with two dark wicker chairs with red cushions. The large, red umbrellas provide shade as you breathe in the clean air of the sweet-smelling flowers and leaves around you. We can’t think of a more calming place to spend your evenings. The pattern of this deck is definitely busier than most, but if you love chevron patterns, it may be just your speed. 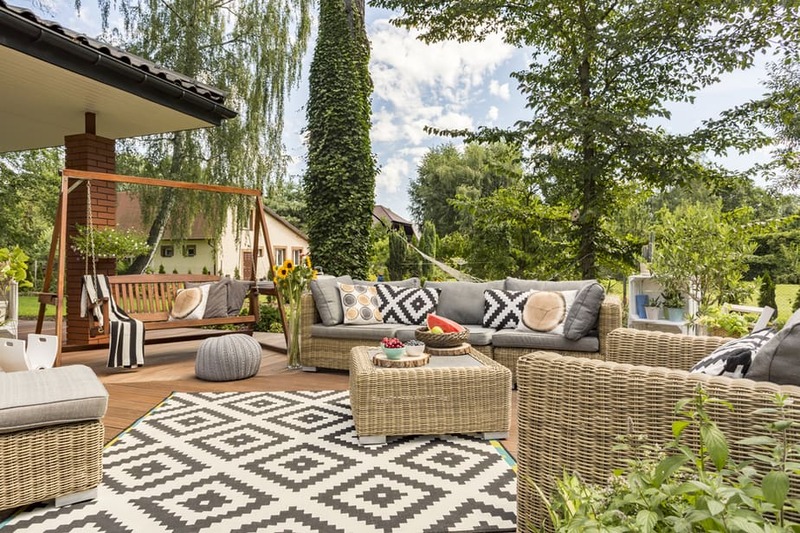 This deck combines the intricate pattern and beige color of wicker furniture with the exuberant ornamentation of the chevron carpet and pillows. And, as we mentioned earlier, this deck also uses a gray color scheme to contrast with the other loud designs. Another great aspect of this deck is the free-standing porch swing which acts as somewhat of an odd, neutral focal point that distracts from the busy patterns of the rest of the deck and ties in with the brown of the wood deck, itself. 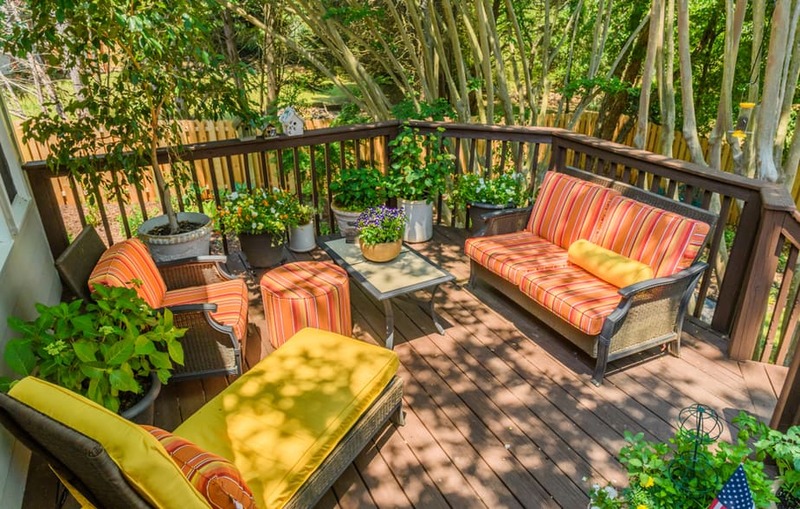 When wanting to add a deck to their home, many people find that nature has already taken over their deck space with a tree or two. Building a deck around a tree is an ingenious way to combat this problem – and it adds character to the outdoor deck, as well. This deck is noticeably contemporary with the wood and wire fence lining the outermost part of the deck and the slim-legged, sleek table in the middle of the seating area. Although, the sandy colors of the furniture contrasted with the bright red pillows (along with the huge plants) truly gives off a tropical feel that is sure to relax any guest. This is one of the most (if not the most) interesting deck design on our list. This deck has a spacious seating area right outside of the glass doors of the home and extends over a man-made (emulation) creek bed to the backyard. It’s such an interesting design that is incredibly uncommon and would look amazing in an immense and open yard. If you’re fond of the outlandish, colorful decor of the 70s, then we’re willing to bet this deck seating set caught your eye. The odd checker-like tables, along with the plastic or rubber red chairs, are unlike anything we’ve seen on an average deck and give an artistic feeling to this space. Rustic home design has become increasingly popular over the past few years with its natural and old-timey aspects. The deck above perfectly exudes this style with the carefully placed bamboo screen, Western chair pillows and reused tree stump tables. The old-time glass candle holders wrapped in twine add to the feel of this space and would create great mood lighting in the evenings. 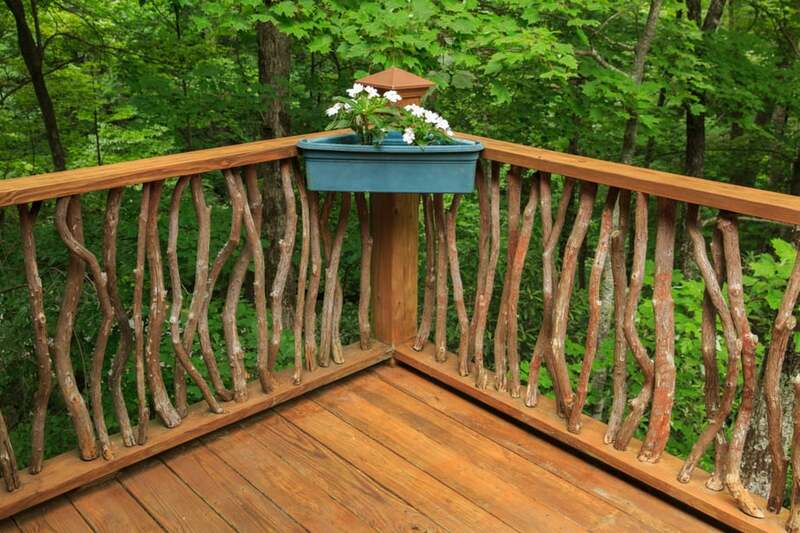 This DIY deck railing is perfect for those who have an abundance of trees (and sticks) on their property. This style would look great coming off of a cabin or otherwise rural home. It seems like a cost-effective, simple deck addition that you can make yourself, and the abnormal design is sure to grab your guest’s attention. Reminiscent of the orange colors of creamsicles, this dainty shaded deck with bright furniture makes for the perfect backyard getaway. The lively oranges, reds, creams, and yellows bring a bit of summer to every occasion no matter the season while the sweet-smelling flowers create a calming, airy scent for the area. The railing lined with plants is wonderful for privacy and adds character to this deck space, as well. This deck with a cropped pergola is a great private area to lounge around on. Though the pergola doesn’t cover the entire deck, it still manages to provide partial shade and blocks the view from a specific space outside of the deck area. This would be wonderful if you’re wanting to partially seclude your deck from neighbors. We all long for the feeling of home every now and again, and this deck is one to remind us of our parent’s and grandparent’s homes. From the white deck railing and adorable bunny figures to the baskets full of fake hydrangeas and padded wicker rocking chair, this deck truly leaves us with a homey feel that we won’t soon forget. This tropical deck set on the side of an aqua-colored building is bright, exotic, and full of character and detail. The pergola is covered in what seems to be beautiful Mexican Tile and stationed in the center is a fan with gorgeous leaf-shaped blades. Colored lights are wrapped around the pergola beams to illuminate the night and natural-appearing wooden furniture covers the floor. 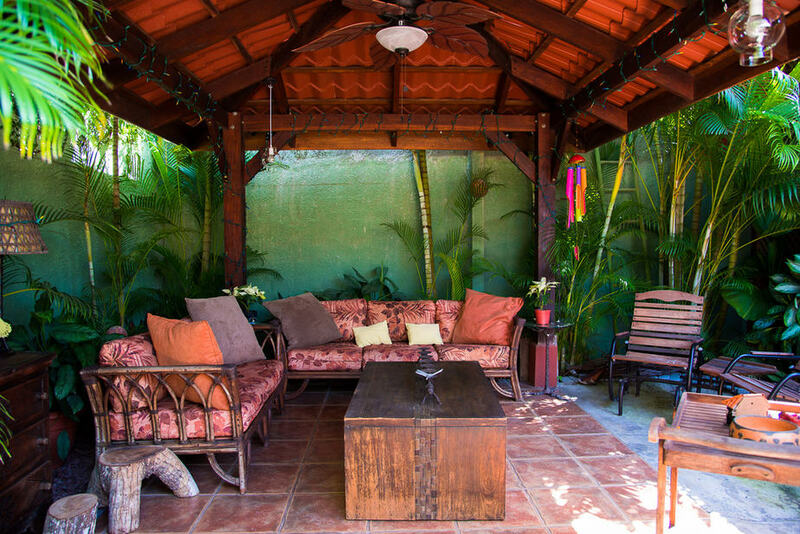 This space would be perfect for those who love the tropics and all that comes with it. Though the deck itself is barren aside from the fall leaves, we thought the entrance to this deck was particularly intriguing and worth putting on our list. The entrance consists of a sliding glass door with two opening windows to the right (or left, depending on where you’re standing). This gives the doorway a very odd, uneven appearance that would look great on the home of an eccentric. This is definitely a deck for the divas out there. From the pink rhinestone and gray velvet cushions to the black wicker furniture with black glass table tops, you can’t get anymore sassy than this. The deck furniture is large enough to seat all of your friends at once (well, a lot of them anyway) and the stylish white table lanterns really tie the whole bold look together. This luxurious deck is positioned outside of an apartment building. Though it’s quaint, there’s still an ample amount of seating room with the light colored wicker love seats and wooden benches (to the bottom left of the photo). The surrounding glass barrier is perfect for an unblocked view of the natural scenery and the beautiful modern stone fireplace adds to the rich ambiance of this space. 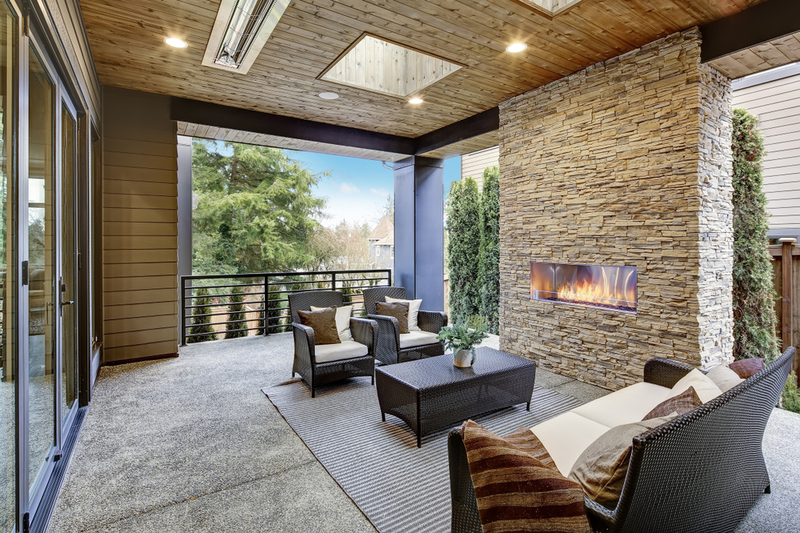 If you have quite the tidy sum to spend on a deck, this luxurious deck with a to-the-ceiling stone fireplace and skylights may be just the outdoor space you’ve been searching for. This deck is railed off on the sides with lovely black iron and seems to open up behind the fireplace to the backyard. It’s minimally furnished, although, with the intricate detailing in the fireplace and beautiful wooden ceiling, we doubt this would be problematic for most. The large shrubs (as well as the fireplace) are perfect for adding privacy to this area and the contrast between the stone, concrete, wood, and wicker textures is incredibly intricate and eye-catching without being too visually overwhelming. 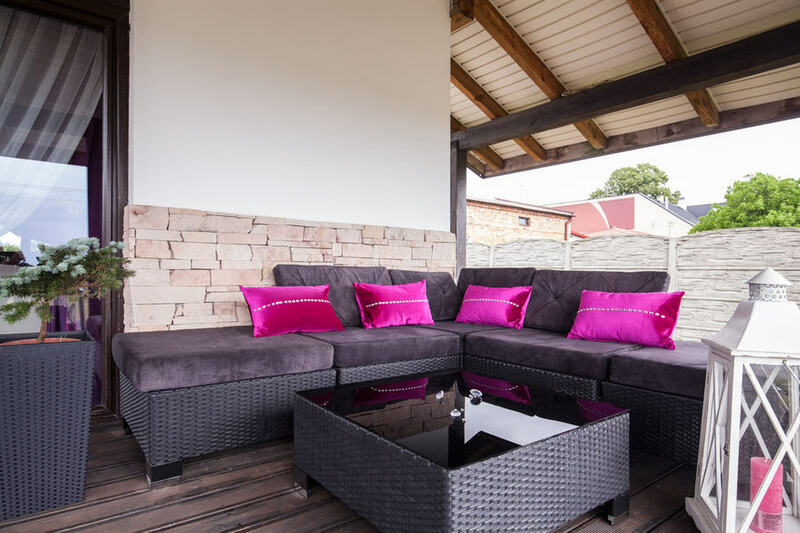 Adding a deck to your home (or revamping the one that you added 10 years ago) is one of the best ways to personalize your backyard and expand the available living area of your property. 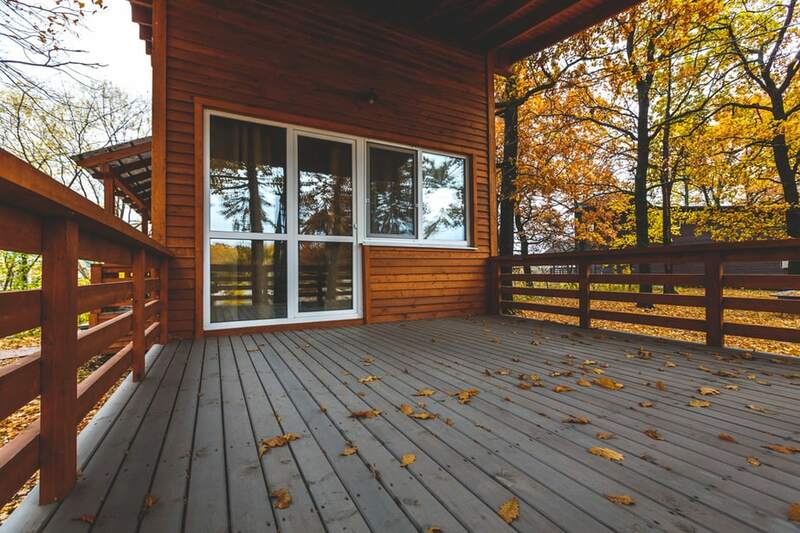 With a deck, your house gatherings will become more spread out and less crowded, your property value will increase if you ever decide to move, and you’ll have a comfortable place outdoors that you can be proud of. Hopefully, these beautiful deck design ideas sparked your imagination and motivated you to get to work!